Earlier this year, the Montana State Senate made national news when legislators proposed creating a $25 “touring cyclist tax,” which would require visiting cyclists to buy a permit in order to ride on 2-lane roads state-wide. Senate President Scott Sales was the most outspoken about the proposal, saying that cyclists were self centered and rude because “they won’t move over. You can honk at them. They think they own the highway.” The strangest thing about the whole deal is that supposedly the money would go to reducing aquatic invasive species, claiming that bicycles transport aquatic species across state lines. It turns out that the whole story was “actually a joke.” Though Mr. Sales found this funny, I’m sure that the thousands of cyclists coming through Montana annually (people of all professions and walks of life, mind you) would most likely not appreciate being called self centered and rude. My guess is that the cyclists he mentioned who wouldn’t move over for cars in the road didn’t feel safe riding through gravelly, uneven, or narrow shoulders, hence the not moving over thing. Maybe if that cyclist tax for riders visiting the Big Sky State went towards widening shoulders or building bike paths, the proposal would have been better received. 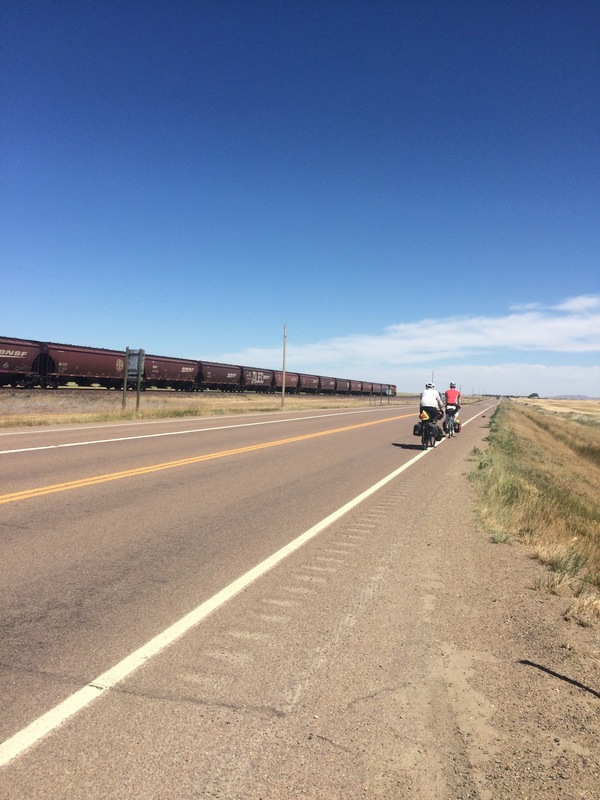 Jeff and Rees skirting the shoulder near Havre, MT. See those beautiful rumble strips? If you couldn’t tell, one of the make-it-or-break-it aspects of cycle touring besides weather conditions and wind patterns is road surfaces. There is nothing better than riding on a lesser-used road wth hardly any traffic or finding a bike path that wasn’t on our maps like we did approaching West Glacier along Highway 2. 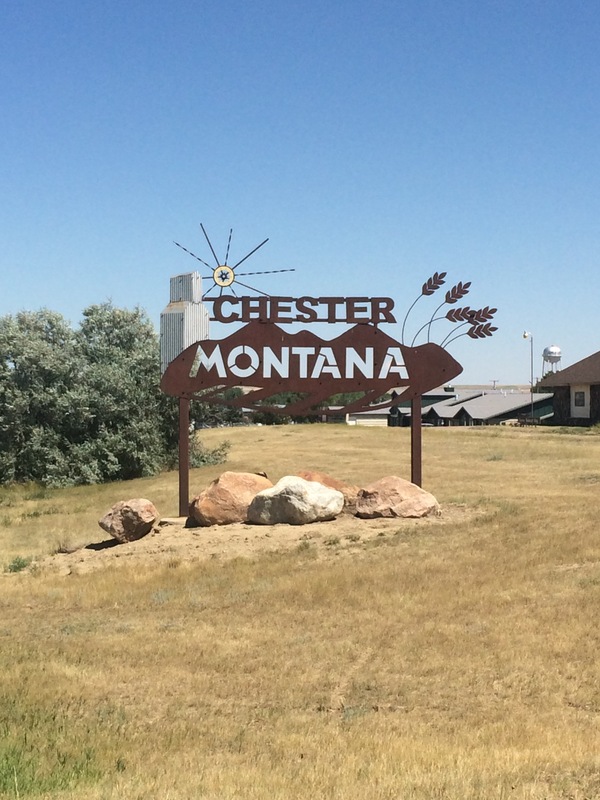 Since we spent much of our journey through Montana on Highway 2, locally known as the Hi-line, we became intimately acquainted with the varying conditions of the shoulders that hug the road. 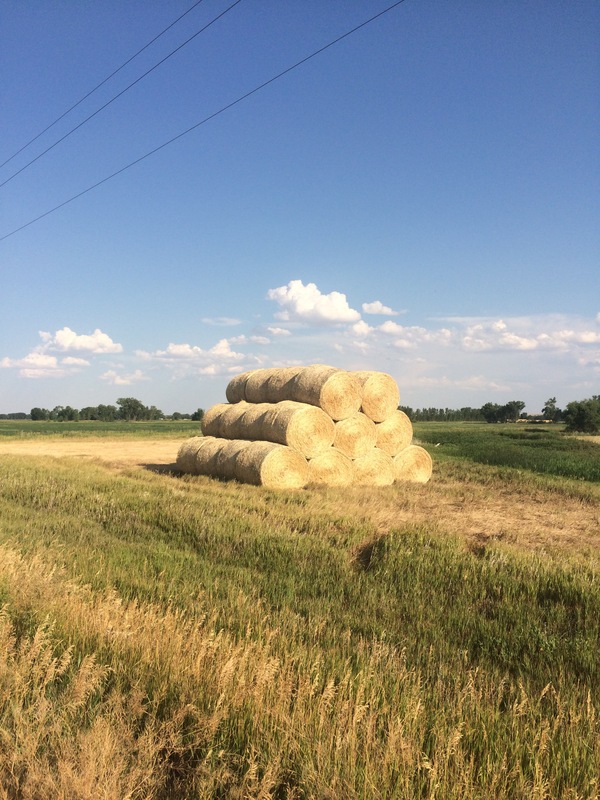 Shoulders in Montana vary from a generous 6-feet wide to 3-feet wide with a rumble strip running down the middle to virtually nonexistent with a sharp ditch falling off to one side. And, mind you, Highway 2 is frequented by grain trucks transporting the world’s grain to farmer cooperatives and train transport all around the state. Large semis are also particularly common in the Northern end where there is both an abundance of grain/legume fields and trains to deliver to! 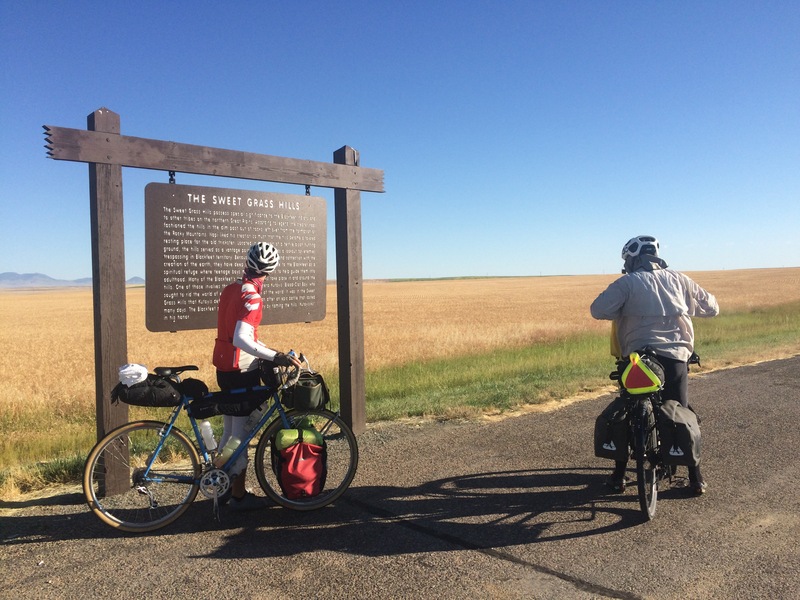 Even though our experience riding the Hi-line almost exclusively from Cut Bank to Wolf Point, MT (almost 350 miles) was colored by hot days, exposed roads, bumpy shoulders, fast traffic, and headwinds, these are certainly not the highlights I will remember. As I reflected in a previous post, it is the people that we brush lives with while on the road that crystallize the memories of our experience. And this has been no different the further we’ve gone. For instance, it was a typically hot and exposed day when we rode into Kremlin, MT looking for water. 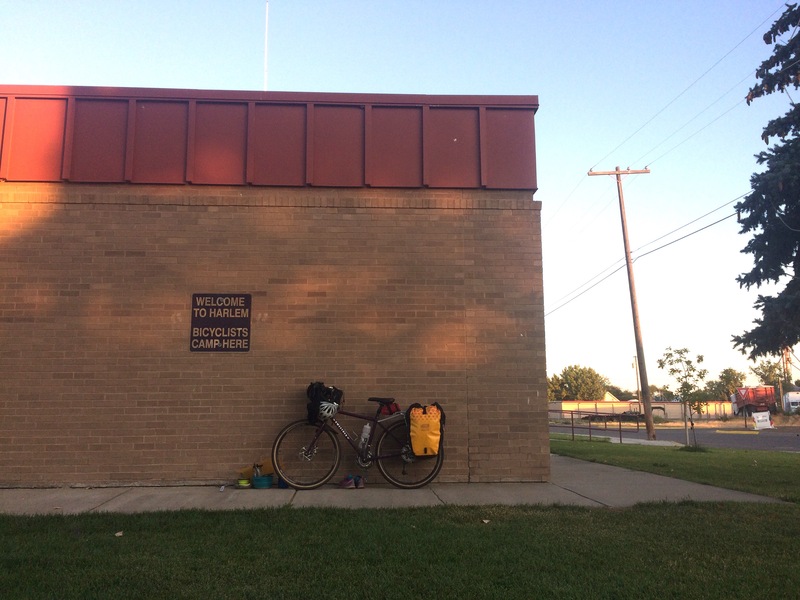 My Adventure Cycling map said there was a convenience store here, the last opportunity to fill up before Havre, 18 miles away. We turned North away from the Hi-line, as all the towns are located on the rail line north of the highway. We saw no one, the school windows cracked and broken. But, as always, an American flag flew proudly outside of the post office, so we went in there to inquire. It turned out that this was the only open public building in town, no convenience store any longer. A man stopped Jeff as he turned by the post office. “Do you need water?” he asked, holding out two ice-cold stainless steel insulated water bottles. “Yes!” we eagerly accepted. Encounter number one. A couple minutes later, as we sat by the shade of the post office enjoying the water, a woman walked up to us, greeting us with a smile. “How are you guys doing?” she asked. “I just saw you out here and wanted to know what you’re up to. I wanted to hear your story!” No one had ever approached us like this who wasn’t a cyclist, so we were in intrigued by her interest and eager to satiate her curiosity. And, of course, we were curious ourselves. Turns out, she was a local, a 3rd generation wheat and legume farmer, wanting to get to know people coming through her small town. And we were delighted to share. Two meaningful encounters in a place that would barely be called a town in other states. We also has the great pleasure of meeting and staying with the Fast family in Glasgow, MT. They have been working the land for many generations as well and know the land backwards and forwards. 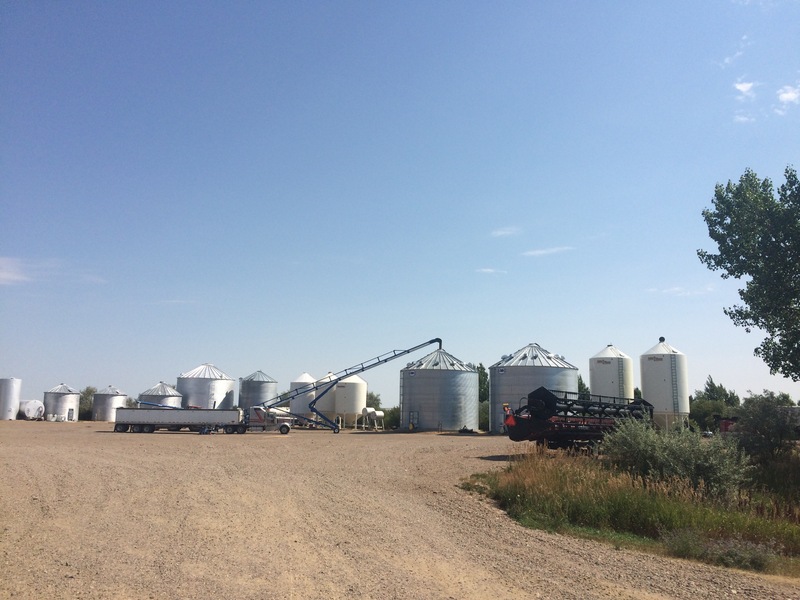 After seeing combines and seeding machines being transported down the highway on the back of semi trucks, it was refreshing to get a personal tour of the farm’s collection of all the machinery that is necessary to plant, tend to, and harvest 25,000 acres of grains and legumes. Not to mention that Don is internationally known as a grain consultant and is asked to speak about international marketing across the world. As has been the case with our other hosts along this journey, we’ve relished stepping into the lives of locals like the Fasts and graciously accepting their hospitality. Our experience riding through towns on the Hi-line with populations ranging from 50-9,000 had been enlightening to say the least. We’ve seen places affected by the rise and fall of industry, as goods transported among the railway (grain, oil, livestock, coal, wood, containers) have garnered unstable prices over the years in places with variable populations. 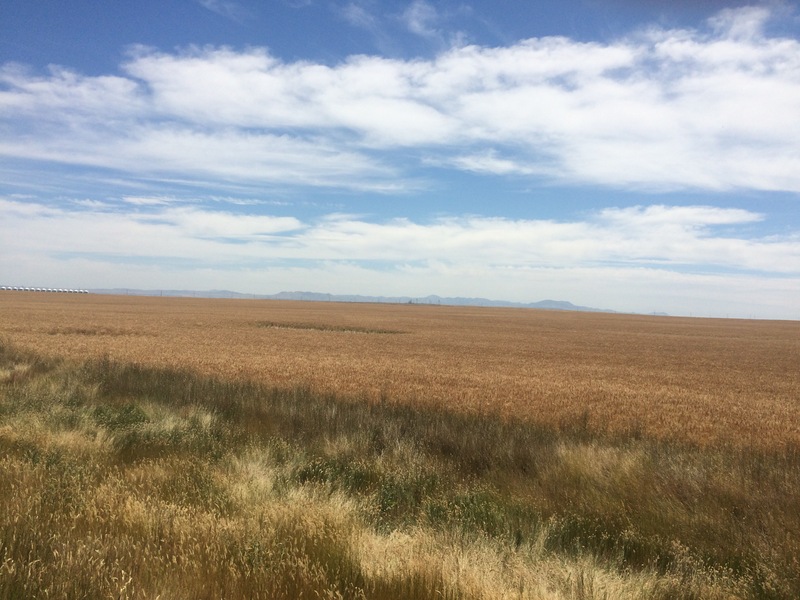 We’ve seen places affected in particular by the rise of agribusiness, as smaller businesses and schools and communities that didn’t have stock in the industry as much as larger places along the highway have withered away. My guess is that the automobile and the Hi-line also have an intimate relationship. Though towns range in distance from 3 miles to 30 miles, there is no way that a car will travel only 3 miles to re-up services, or 30 miles for that matter. So it is really only the larger towns that will get the tourist business as well. But guess who favors these 30-mile-or-less distances? You got it, touring cyclists. We can’t go more than 40 miles or so without filling water bottles, less if the day is particularly hot. We also need food, and at regular intervals, as it is difficult to carry more than 1-2 days of food at a time. We also need shelter, as 70-80 miles is a long distance for most of us to travel (imagine how fast you’d travel that distance in a car). So touring cyclists need these smaller towns for food, water, shelter, and good old-fashioned conversation. In other words, we’re some of the few passersby that need these places to thrive. And have we been treated well! 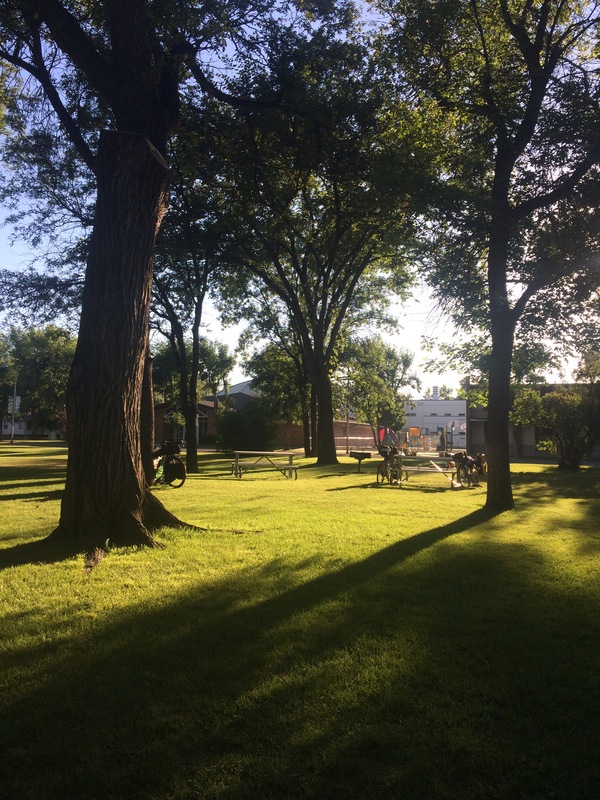 Most towns along the Hi-line will allow cyclists to camp for free in their city parks, use public showers for a minimal fee, and even leave the City Hall open all night for us to use the bathroom as was the case in Harlem, MT. Along the way we’ve shared stories and BBQ with firefighters in Wolf Point, MT and accepted advice from neighbors concerned that we’d be soaked by sprinklers in Havre, MT (they were right)! So, Mr. Sales, cyclists are not self-centered or rude. In fact, though we are looking out for our own safety on the road, at the same time we bring thousands of dollars into rural economies who could use some tourists traveling at a slower pace. We are people that eat pie at the local diner for fuel, seek out connection and conversation, and are always bringing stories down the road, not car exhaust. Tags: Adventure Cycling, bicycle touring, bicycles, community, history, humans, park, questions, road trip, stories, summer, sun, travel. Bookmark the permalink. Previous post ← What’s your mountain mantra? Jeff’s maternal great grandfather sold farm machinery in Honolulu in the early 1940s for Case and in Chico, CA in the late 1940s and 1950s for Massey-Ferguson. Jeff’s mother, Claudia, and I and our sister Carrie used to climb on the tractors and harvesters and threshers and combines and pretend we were driving them when we were young. I really enjoyed reading this entry to your blog, Katie! So true! I am learning the true value of being in the moment this trip. Hi Katie and Jeff! I’m Kathy Williams, Claudia, Catie and Carrie’s first cousin in Shreveport, LA. Tell Jeff I met him at Amy’s wedding in FL. Catie put me onto your blog and I’m so glad! I’ll really enjoy living vicariously through your cycling experiences. Thanks for writing!